Okay! We're going to pretend like I never left, alright? Alright. I think I'm going to dust this off for various verbing purposes, and flailing about various media that I'm consuming. Also, I'm nominating/voting on the Hugo awards again this year, so I can use this to organize/talk about what I'll be nominating, and possibly make or get recommendations (depending on how many people even still read this thing). 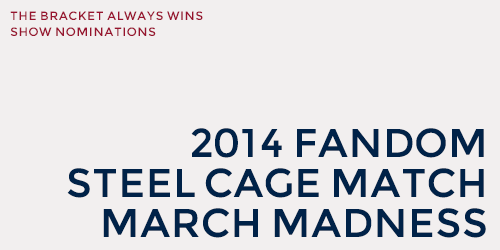 First things first: It's Fandom March Madness time! Second things second: I'm playing the Ace Attorney games! I have been flailing over on Spoils as I go, but I figure I can take a page from spectralbovine's book and use this journal as sort of a general review aggregator. About the games in particular, I'm about 3/4 of the way through the 4th game (Apollo Justice: Ace Attorney), and I'm really enjoying them. It's the same kind of investigative cleverness that I love about the Nancy Drew games, but in a courtroom setting, and I get to pound a desk and point and say 'Objection!' a lot. Which I love. Whew. I think that's enough for now, but stay tuned! I can't believe it's been almost two years since I last posted here. Tumblr and the Mark Does Stuff communities have pretty much taken over my online social presence. So this is just a quick check in before Fandom March Madness, gotta keep my LJ muscles in shape and all that. I know, I know, long time no write. There've been things. And stuff. So that's what's up in my corner of the cosmos! Um...any other good 30-day memes floating around out there? I'm not generally one to plug fanfic, but...this is seriously the most amazing thing I've ever read. And I'm only on chapter 5. Harry was breathing in short pants. His voice came out choked. "You can't DO that!" "It's only a Transfiguration," said McGonagall. "An Animagus transformation, to be exact." "You turned into a cat! A SMALL cat! You violated Conservation of Energy! That's not just an arbitrary rule, it's implied by the form of the quantum Hamiltonian! Rejecting it destroys unitarity and then you get FTL signaling! And cats are COMPLICATED! A human mind can't just visualize a whole cat's anatomy and, and all the cat biochemistry, and what about the neurology? How can you go on thinking using a cat-sized brain?" McGonagall's lips were twitching harder now. "Magic."